Thundarr and his friends attempt to rescue an imperiled ship at sea in “The Mystery Zone” -- think the Bermuda Triangle -- and run across the evil witch Circe, and her minions. Circe has been living under a curse for 500 years. She must remain forever on the island (in the ruins of London, England…) or turn to stone. But now, Circe hopes to switch her consciousness into Ariel’s young body, and outsmart her captors. She lures Thundarr and the others into the trap, and makes the soul transfer in secret. 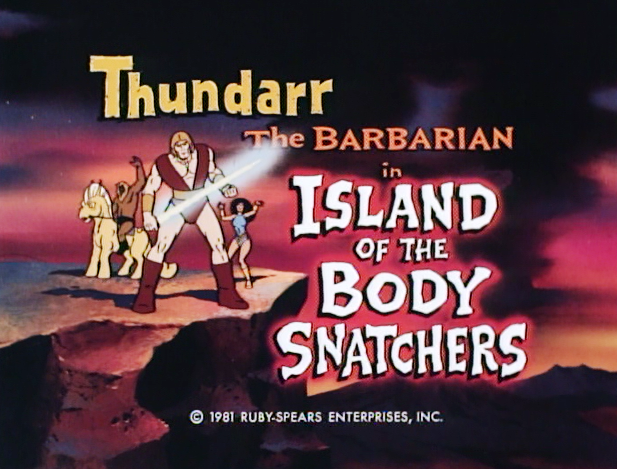 With Ariel’s beauty, vitality and very soul on the line, “Island of the Body Snatchers” feels a little more urgent or suspenseful than some episodes of Thundarr the Barbarian. Specifically, Ariel sees her beautiful visage stolen by the witch Circe, while she is left a hideous old hag. And worse, Thundarr doesn’t believe her story of soul transfer. In fact, he laughs at her. 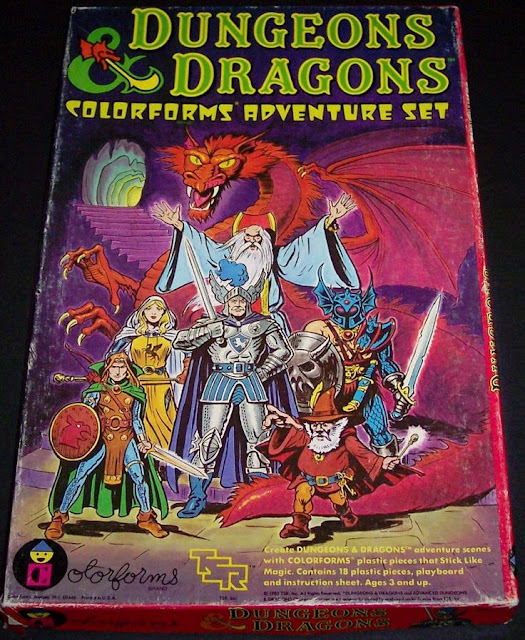 There’s a nice paranoid aspect to this tale, as well as a little social commentary about how Thundarr’s society (and perhaps our society too…) views the old and the ugly. Regardless of the precise details, it is nice to get away from the “save the human village of the week” routine and into something a bit different. In this case,”Island of the Body Snatchers” also seems inspired by several elements of Greek Myth. There, Circe was known as a goddess or witch of magic, the daughter of Helios and Perse. 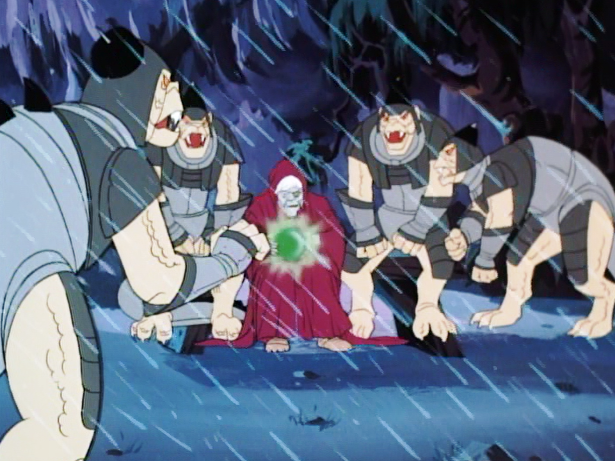 Like the mythological Circe, the witch on Thundarr can transform men into animal minions resembling pig or swine. Also like Greek myth, the Circe in “Island of the Body Snatchers” was exiled to an island and forced to remain there. Specifically, Circe appeared in Homer’s Odyssey, which also featured an interlude with sirens, and “Island of the Body Snatchers” also concerns ships lost at sea, buffeted by rocky, turbulent waters, like that legend. 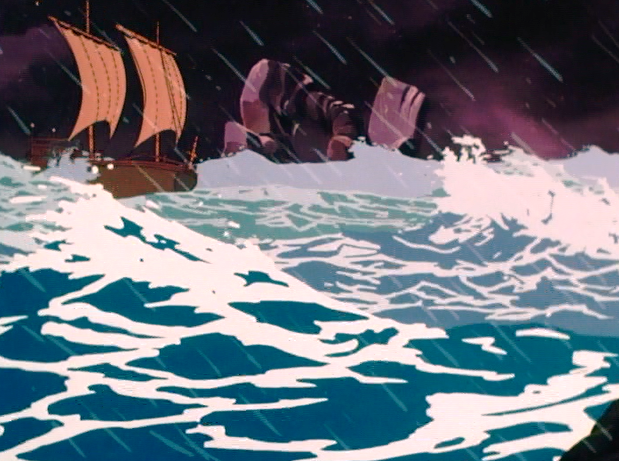 Once more, the visuals of a Thundarr the Barbarian episode prove incredibly appealing and resonant. 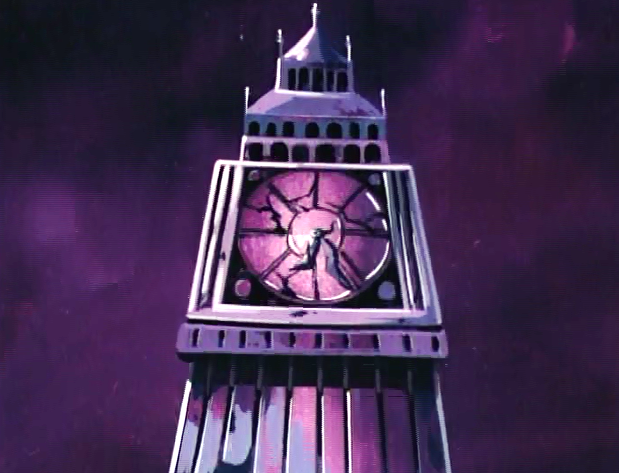 In particular, much of the action here takes place around a ruined Big Ben, and Circe’s escape route is via a helicopter on an off-shore oil rig. These connections to our world make the story all the more intriguing and colorful, and in toto this is one of the best, most rip-roaring exciting episodes of the series thus far. Thanks for another good review. I remember this episode from its original airing and have watched it in more recent years (to review the appearance of Circe). I agree about the quality of this episode, which I think holds up well even today. John nice review. The Thundarr locations make the series work because it lacks the generic settings of Ark II that were not interesting. I continue to enjoy your weekly posts about "Thundarr" episodes, though this one was one of my least favorite as a kid, actually. In part, I remember thinking it was one of the least location-specific episodes. As you referenced in your post, there was some vague allusion to a "Bermuda Triangle-esque" location at the start, wherein their ship was attacked by what looked like the Loch Ness monster (in the open ocean? ), then they suddenly arrive (all the way across the Atlantic) in London. And finally, the end comes on an off shore oil rig which, to me as a an American kid, seemed more like something that might've been in the Gulf of Mexico than in the North Sea (with which I was totally unfamiliar as a child).